The delay may make it easier for rivals like Samsung Electronics to win over consumers to phones that connect to 5G networks, which will provide a leap forward in mobile data speeds when they are introduced in 2019. Apple’s previous calculations - proven correct - were that the new networks and the first versions of rival smartphones would come with problems such as spotty coverage, making consumers less compelled to immediately make the jump. This time, 5G boosters argue the switch is a much bigger speed upgrade, making Apple’s decision to wait riskier. The networks will open the floodgates to new types of mobile computing, 5G advocates say. The decision to sit on the sidelines may be related to the company’s feud with Qualcomm, the leader in 5G-enabled chips, and its alliance instead with Intel, which won’t have chips available in time to support 2019 phones. But going into 2019, the stakes have changed: the leap from 4G to 5G is significant enough that it may become a major selling point for new devices. Samsung plans to have 5G phones in its Galaxy range next year. And in China - the largest market for smartphones - major producers Oppo and Huawei Technologies also have indicated they plan to offer 5G phones. "Apple has always been a laggard in cellular technology," said Mark Hung, an analyst at Gartner. "They weren’t impacted in the past, but 5G is going to be much easier to market. But if they wait beyond 2020, then I think they’ll be impacted." 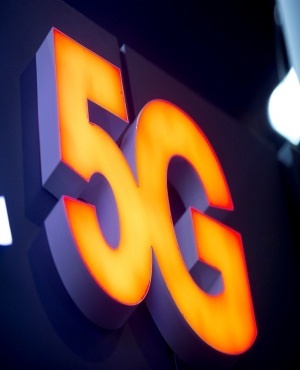 Wireless carriers like Verizon Communications and AT&T are likely to prioritize the marketing of 5G phones in order to get customers to migrate over as soon as possible. The new networks will take advantage of a greater range of radio frequencies and be capable of carrying much higher-speed data. That provides an incentive to move traffic to the speedier networks because it will lower the costs for the wireless carriers. Think of the difference in the number of cars a multi-lane freeway can accommodate versus a single-lane regular road. Huawei and Samsung can build 5G modems - not just Intel and Qualcomm. But Apple is unlikely to use chips from competitors, and the companies may also struggle to produce enough supply for the iPhone’s huge volumes - more than 200 million a year.